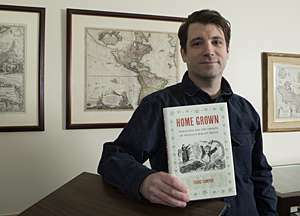 Isaac Campos also is author of "Home Grown," which traces the origins of Mexico's war on drugs. Researchers say they're at the forefront of a new movement delving into the deep history of illicit drug use in Latin America and how it affects the rest of the world, a history that spans numerous fields of study. It's a history leading to the war on drugs in the United States, the largest international consumer of illegal drugs. This groundbreaking research is revealed in a current special issue of the Hispanic American Historical Review, published by Duke University Press and co-edited by Paul Gootenberg, a SUNY Distinguished Professor of History and Sociology, and Isaac Campos, a University of Cincinnati associate professor of history. The editors contributed a special introduction to the journal that traces the Latin American drug trades and cultures through the region's history, revealing that historians are just now beginning to research this area. "There may have once been some reluctance among scholars to study drug use and the drug trade because of the potential stigma attached, with people wondering if the researcher might be a user or advocate," says Campos. "Gradually, attitudes have changed. We now have a little bit of distance from the most emotional and politicized moments in the U.S. war on drugs, and we're getting a significant upsurge of study into the topic. "Oftentimes, people don't understand the importance of history until it clearly links to something in the present moment," says Campos. "That's what is happening now, with the tremendous drug-war violence in Mexico over the past decade." Campos adds that Mexico is the world's richest country in hallucinogenic drugs, using them for medical, recreational and religious purposes for thousands of years. Campos says this "new drug history" connects local and global events. "By examining the history of drugs in Latin America, we might better understand the complex origins of drug policies that have inspired murderous violence in Mexico, with something like 100,000 deaths in Mexico the last eight years alone, or we might better understand the origins of the present controversies over marijuana legalization in the United States," says Campos. "How did we get to this place? Why are current policies failing? We're also providing examples from the past of other ways societies have dealt with drugs and other ways drugs have been understood." "By taking the study outside the U.S., we're offering new perspectives on how other societies have also fetishized certain drugs at different times." Prehistoric to the Spanish and Portuguese Conquest - The history is an exploration of how the "plants of the gods" impacted ancient cultures, from religious to healing rituals. The Early Modern Era - Drugs began developing as an international trade over this period from 1492 to roughly 1800. Campos says substances including tobacco, tea, coffee, distilled spirits and the "drug food" sugar helped grease the wheels for emerging global capitalism. A Long 19th Century - From around 1800 to World War II, certain drugs became closely associated with emerging nations while modern underground drug cultures began developing. "During this period certain drugs became closely associated with specific nations, something that could serve as a source of pride or an excuse to prohibit," says Campos. "Therefore, one of the key arguments against certain kinds of drugs in the U.S. was that 'foreigners' used them." Post WWII and the Emergence of Major International Drug Trafficking - This era marks the growth of drug trafficking cartels, the heavily funded, militarized war on drugs and an explosion in recreational drug use in the 1960s. "One important argument we make is that often the war on drugs has been portrayed as simply a U.S. imposition on the rest of the world," says Campos. "While the U.S. deserves plenty of blame, we've found that there are deep roots in other places for drug prohibitions. For example, the so-called 'reefer madness' ideas in the United States had origins in Mexico. Therefore, Mexico influenced the prohibition of marijuana in the U.S. This is a perfect example of how studying Latin America has helped us better understand the history of drugs in the U.S.," says Campos. The journal also examines previous drug scares or what were called drug epidemics, such as the current heroin epidemic in the U.S. "We find other examples of what society perceived to be a major drug problem. We usually find that part of that belief was legitimate and quite a bit of it was overblown, and that can give us perspective on current situations," says Campos. The Hispanic American Historical Review is the preeminent journal in the field of Latin American history. The special issue features three essays on Latin American drug history including a study of youth culture, drugs and politics in Cold War Argentina, an essay by Valeria Manzano, associate professor of history at Argentina's Universidad Nacional de San Martin and researcher at that country's Consejo Nacional de Investigaciones Cientificas y Técnicas. Manzano demonstrates how a 1970s drug scare helped justify military dictatorship and repression in Cold War Argentina. Another essay by Lina Britto, an assistant professor of history at Northwestern University, connects a boom in Vallenato, a rural style of music which became a kind of national symbol in Colombia, with 1970s marijuana trafficking. The journal's final essay, titled, "Salvador Roquet, María Sabina, and the Trouble with Jipis," was contributed by Alexander S. Dawson, professor of history at Simon Fraser University. The essay explores the controversial work of a Mexican psychiatrist in the 1970s who, sometimes in collaboration with an iconic Mexican shaman, treated psychiatric patients with hallucinogenic drugs.